To control data migration in the virtual infrastructure, Veeam Backup & Replication introduces a notion of location. A location defines a geographic region, or country, in which an infrastructure object resides. You can create a list of locations, and assign to backup infrastructure objects information about locations to which they belong. Virtual infrastructure objects: SCVMM, clusters and hosts. Backup infrastructure objects: backup repositories, external repositories, scale-out backup repositories, tape libraries and tape vaults. Agent management objects: protection groups. Information about infrastructure objects location is stored in the Veeam Backup & Replication configuration database. When VM data in the virtual infrastructure migrate from one location to another, Veeam Backup & Replication displays a warning and stores a record about data migration to job or task session details. In addition to it, Veeam Backup & Replication logs this information to Microsoft Windows event logs. 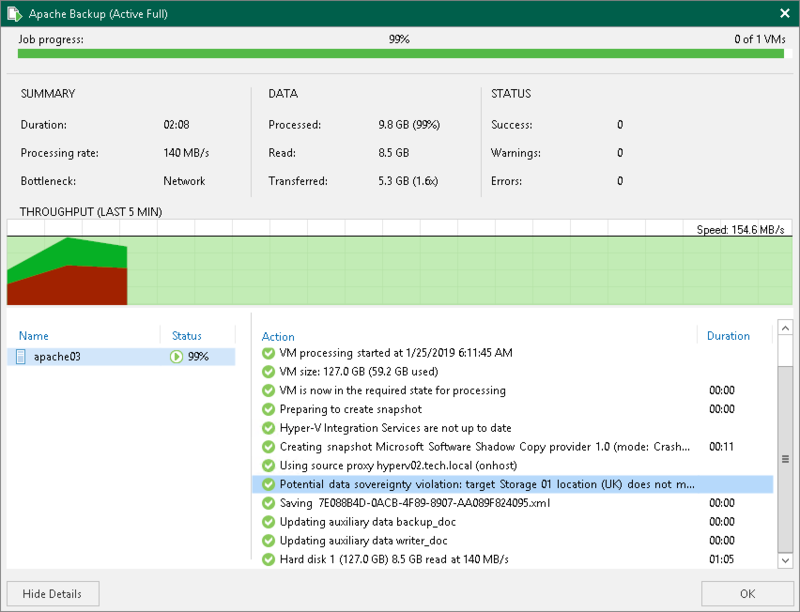 For example, if you back up VMs from a host that resides in Germany to a backup repository that resides in Australia, Veeam Backup & Replication will display a warning that VM data changes its location in the backup job wizard, display information about data migration in the backup job session details and log it to Microsoft Windows event logs. Backup jobs — Veeam Backup & Replication compares the location of the source host on which VMs are registered with the location of the target backup repository or cloud repository. Backup copy jobs — Veeam Backup & Replication compares the location of the source host with the location of the target host. VeeamZIP tasks (except the cases when you select to store the VeeamZIP file in a local or shared folder) — Veeam Backup & Replication compares the location of the source host on which VMs are registered with the location of the target backup repository. Replication jobs — Veeam Backup & Replication compares the location of the source host on which VMs are registered with the location of the target host. Replica failback tasks — Veeam Backup & Replication compares the location of the source host with the location of the host to which the VM is restored. Entire VM restore tasks — Veeam Backup & Replication compares the location of the source host with the location of the host to which VMs are restored. Backup copy jobs: Veeam Backup & Replication compares the location of the source external repository with the location of the target backup repository. Restore to Amazon EC2: Veeam Backup & Replication compares the geographic region of the backed up EC2 instance with the geographic region of the target EC2 instance. Restore to Microsoft Azure: Veeam Backup & Replication always displays a warning about VM data migration when restore to Microsoft Azure is performed from external repositories. If a VM is added to the application group, Veeam Backup & Replication compares the host on which the VM is registered (or was registered at the moment of backup) with the target location. If a VM is added to the SureBackup job from the linked job, Veeam Backup & Replication compares the backup repository on which the backup file resides with the target location. Backup to tape jobs: In backup to tape jobs, Veeam Backup & Replication compares the location of the source job or repository with the location of the tape library in the target media pool. If the media pool spans multiple tape libraries, Veeam Backup & Replication analyzes locations of all libraries in the media pool. Vaults: If a tape job exports offline backups to a vault, Veeam Backup & Replication compares the location of the source job or repository with the location of the vault. I a GFS tape job exports tapes to multiple vaults, Veeam Backup & Replication analyzes all vaults configured for target media pools of the GFS tape job. Media pools: Veeam Backup & Replication compares locations of all tape libraries added to the media pool. If the media pool exports tapes to a vault, Veeam Backup & Replication analyzes all vaults configured for the media pool. For SureReplica jobs, Veeam Backup & Replication does not compare information about source and target hosts location. Veeam Backup & Replication does not display a warning about VM data migration for file copy jobs.